I have decided to include verse 1 in all the following 7 “A time for everything” scenes & articles notes, to remind the viewer of the point of the list (verses 2-8). The teacher (king Solomon) refers here (verse 1-8) to every activity under heaven, meaning everything that we human beings get up to. Our achievements, our follies, our actions, our lack of actions, our moods & attitudes. Of course this is not a comprehensive list of ALL human activity, but I think it is indicative of the major headings of human activity. By looking at other versions of the Bible we can get a more complete understanding of what the teacher was writing about. Verse 1 in the Amplified Bible refers to “every matter or purpose under heaven”. In the Message version “a right time for everything on the earth” is referred to, whilst the Bible in Basic English calls it “every business under the sun”. The English Standard Version refers to it as “every matter under heaven”. The Hebrew word for “activity,” (chephets (transliteration); pronounced khā‘·fets) always used of people, literally means “delight”, “desire”, “longing”, “the good pleasure” &/or “that in which one takes delight”. The word also refers to willing participation &/or acceptable purpose. Notice it says ALL their deeds, not merely some of them. It refers to all deeds we willingly participate in. The teacher followed his general statement (”There is a time for everything…”) with a poem composed of 7 pairs (14 in total) of polar opposites. It is interesting that king Solomon used 7 pairs of polar opposites (the poetical device called merism), since the number 7 suggests the idea of completeness or totality in Hebrew literature. Solomon begins his poem with “birth & death” and ends it with “war & peace”, with all the other human activities in between these grandest & gravest of themes. 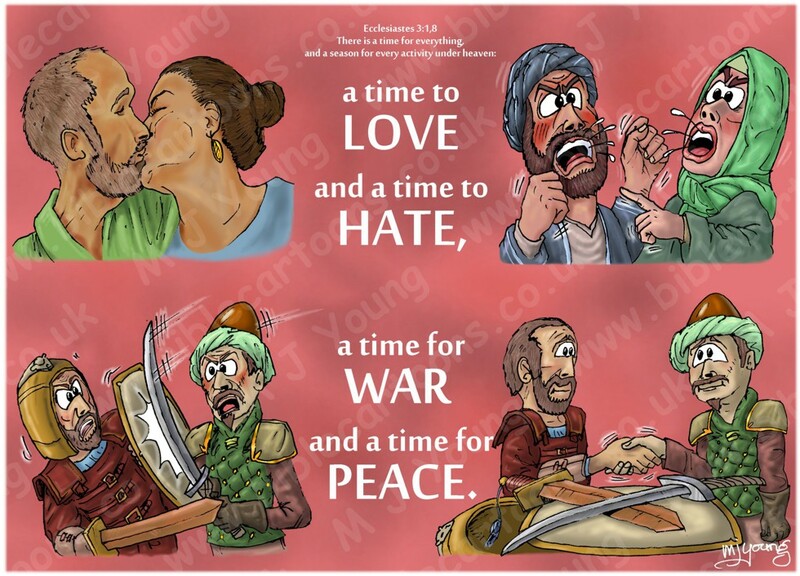 Now to the particulars: verse 8 – “a time to love and a time to hate, a time for war and a time for peace” the polar opposites in this verse are loving & hating, war (or fighting) & peace. So far we’ve seen that King Solomon’s poem begins in reference to birth (the beginning of a person’s physical life) and death (the end of a person’s physical life), & in this last part it seems to end in similar stark contrasts. 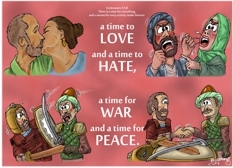 In the Message bible it says “A right time to love and another to hate, A right time to wage war and another to make peace.” It makes the point that there is a “right” or correct time for all these activities. So the first pair of polar opposites are comparing love & loving with hating (though not necessarily open conflict or physical hurting). The second pair are comparing war (fighting, conflict, deliberate going to war) with making peace. To illustrate the first two polar opposites I have drawn an older man & woman kissing, in the top left corner, compared to a red-faced, shouting man & woman, arguing & appearing close to coming to blows in the top right. The second pair of polar opposites “a time for war and a time for peace” are in the bottom left & right of the picture. The first shows two men in armour with swords, fighting. The man on the right is sort of oriental looking & is bashing his scimitar sword against the other man’s shield! I decided to have the same two men represent peace in the bottom right. Notice they have laid down their weapons between them & are shaking hands, which is a symbolic act of peace & agreement. King Solomon closed his list of polar opposites (in verse 8) by referring to life’s two basic & possibly strongest emotions, love and hate. I suppose the ultimate external expressions of these states is war (the most hostile expression) and its opposite, peace. It might be significant that the poem ends, as it began, with a set of opposites (war and peace) over which a person has little personal control.